Having a physical, sensory, cognitive or medical disability can be challenging even when things are running smoothly but if SHTF, life could really get sticky. Regardless of your situation, you need to take some extra steps in your preparedness plan. Today we’re going to offer some tips and tricks for people with disabilities. Emergencies typically strike quickly and force you to make a snap decision about whether to stay home or bug out. You need to have plans for both. Just like everybody else, you need to have plenty of food and water in case you decide to stay and you need to have a place to go if you decide to leave. Sounds simple in theory, right? Making it happen is a bit more complicated. This advice is going to be a bit generic because only you know your strengths and limitations. Make plans accordingly. Especially if you can’t evacuate on your own, building a personal support network is crucial. It should consist of people who know you and know your needs as well as your strengths. At least three of them should also live close enough to you – preferably within walking distance – to get to you quickly. These people will call to check on you and if they can’t reach you by phone, make arrangements for them to come check on you in person. They may be neighbors, friends, family members or members of clubs, churches or organizations. Don’t make plans with just one person. You should have at least three or four people who will include you in their own preparedness plans. That way, if one person can’t get to you, another can. Just like any other prepper, you need to know your local area and determine what disasters you need to prepare for. Know your area and what emergencies are likely. You may also have other concerns such as financial crashes or terrorist attacks that you want to include in your plan. That’s up to you but deciding what you’re preparing for is the first step of your plan. After you decide what you’re preparing for, make a list of the type of assistance that you’ll need to survive. Will you need adaptive equipment? Meds? Medical supplies? Will your caregiver, if you have one, be able to get to you? Will you be able to drive out or will you need somebody to come get you? Do you have a service animal? Make a complete list of what you’ll need and use that list to make your plan. Depending upon the type of emergency you’re preparing for, most communities have assistance programs for people with disabilities. From evacuation shelters to transportation services, you may be able to receive the assistance you need to get out of your house and to safety. If you’re planning more on a SHTF-type situation such as a terrorist attack or an economic crash, your plans will need to be different; at that point community services will likely break down and you won’t be able to depend upon them. That’s where your personal support network will come in handy. If you require special equipment such as a cane, wheelchair, hearing aids, glasses or prosthetic devices, have a backup and an extra. If something were to happen to those devices, what would you do? You probably already know where you can purchase what you need but sources such as Goodwill, thrift shops and yard sales are great places to pick up extras for very little money. This is often tough to do because of medication regulations but most prescriptions can be picked up at least a few days early. Try to store back a bit of your medication each month so that you’ll have extra to get you through an emergency in case services break down. Another good idea is to find natural alternatives to your medications. Sometimes this is viable and sometimes it isn’t but Eastern Medicine has been in existence for thousands of years and has natural treatments for many ailments. After all, something is better than nothing if the emergency lasts long enough for you to run out of meds. Simply because people know that you have a disability, you’ll be an easier target for people who didn’t bother to prepare. Telling people that you have enough food and supplies to get through an emergency is a bad idea. When SHTF, they’ll remember that conversation and even the nicest people won’t be so nice when their families are starving. 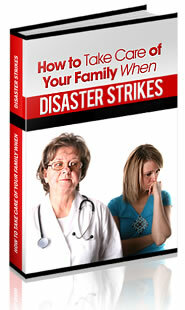 Of course, fill in the emergencies that you’re preparing for, but you get the idea. If you get a positive response, pursue the subject a bit more without revealing that you’re prepping until you’re sure that they are, too. They may be as hesitant to discuss it as you are but it will be good to have a network if you can find one. In a post-SHTF situation, you may not be as physically capable as others but if you have skills that other people need, you’ll have a valuable place in the community. Whether it’s fixing cars, making fuel from veggie oil, canning, gardening or healing, learn as many skills as you can. People will be willing to trade skills so you can make up for any physical tasks that you may be incapable of. If you live in an area prone to hurricanes, tornadoes or earthquakes, there are certain safety precautions that are recommended. For instance, in the event of an earthquake, safety protocol says to get under a desk, stand in a doorway or get into a corner but if you’re not ambulatory, that’s going to be tough. You need to learn what you need to do that’s within your capabilities to stay safe. Make sure that you have a bag packed that includes everything that you’ll need for at least 24 hours. This includes your meds along with clothes, water, a med kit and everything else that a standard bug out bag has. Be sure that it’s not so heavy or large that you can’t carry it in some manner, though. Having a disability doesn’t make you helpless but it does mean that you’re going to have to make some extra provisions for your own safety and welfare in case SHTF. You can survive any situation; you only have to do what you do every day…work with your strengths and compensate for your own needs. If you have any good prepping tips for people with disabilities, please feel free to share them in the comments section below!